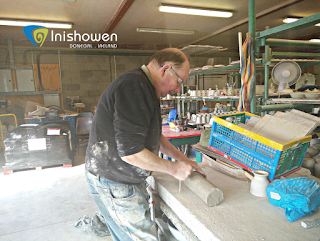 At Moville Pottery you have the opportunity to get hands on and be creative. 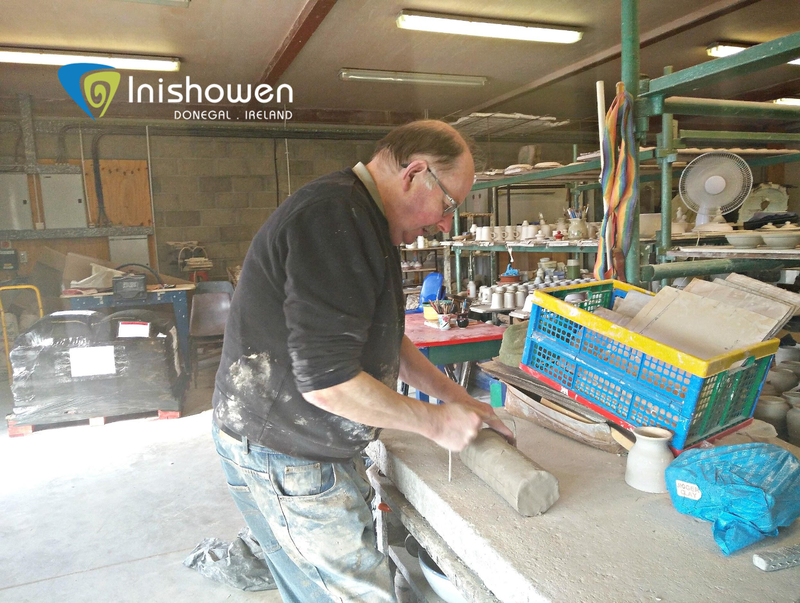 A particular example is the "Paint Your Own Pot" activity which takes place in the workshop adjacent to the shop. You have the option to chose the design and type of pot you will paint and an added bonus is you get to view the process of pot making happen right beside you. 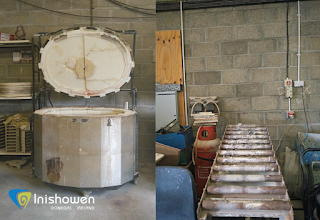 Lowry Wasson and Brian McLaughlin, owner, director and potter at Moville Pottery, invited me to their pottery workshop to see how and where their pottery range is hand crafted and created. In the above, behind the scenes shot, a selection of mugs are being air dried before they are given the first of two firings in the kilns pictured below on the left hand side. Having never made pottery before, Lowry steps me through the process. Pictured above on the right hand side is a pug mill where clay is passed through to get rid of any air or lumps. The clay is carefully measured into individual balls, pictured above & hand thrown on the potter's wheel. You can see Lowry below giving a demonstration of this artistic process. Lowry was trained by some of the best "Throwers" in the World, training in Ireland, Northern Ireland and Europe. You will notice Lowry makes it look very easy! After the handcrafted pots have half dried, they are put back on the wheel and additions, like the handles for the mugs can be added. 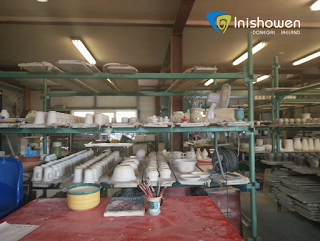 After the first firing, the pots are skillfully hand glazed & decorated. The last stage is for the pots to be packed into the kiln and fired to 1220 degrees Celsius, which Lowry explains "creates a shiny effect" on the pottery and "being fired to this temperature allows the pottery pieces to be microwaved and placed in the oven without cracking"
The artistic and creative process is then complete and the pots are cooled and ready to be shipped, collected by the customer or placed on display for you to view or purchase in the shop, pictured above. 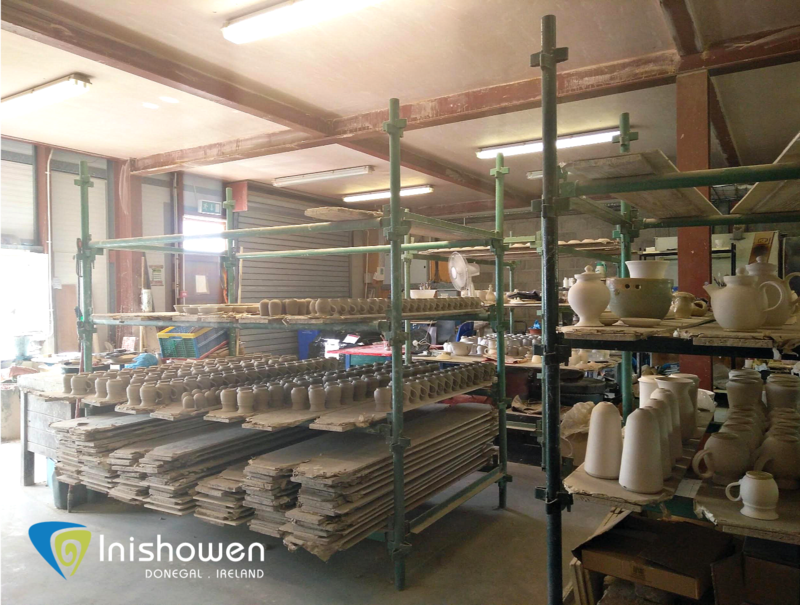 Moville Pottery is not only popular with locals and visitors, but also with famous movie stars. Lowry & Brian, "were delighted to place an order for iconic movie stars like Marlon Brando, Johnny Depp and local star Art Parkinson, who played Rickon Stark in Game of Thrones.". 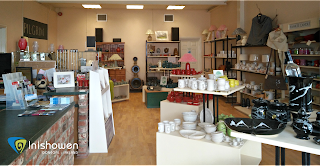 Recently the team had a stand of Moville Pottery in a scene shot during the popular TV production "Jack Taylor". Whether you visit to view Moville Potterys range of pottery and local craft on display in the shop or to get hands on in the workshop, you will leave with an appreciation of the skill and artistic craft involved in making pottery. Tell use what you think? Add any comments or questions about the blog below.